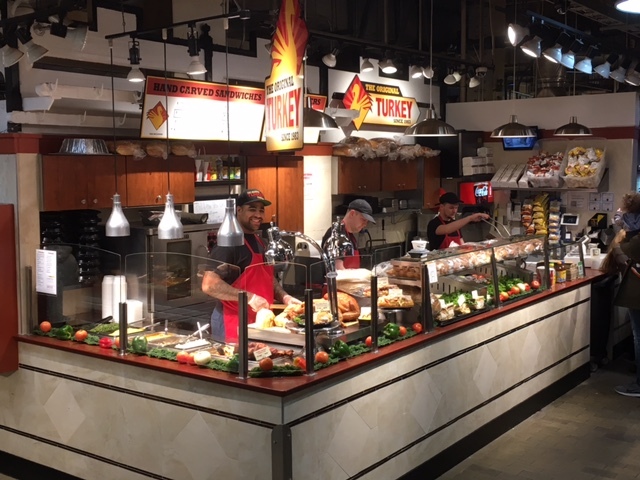 We’ve got what America’s hungry for…Fresh roasted turkey, carved by hand. Steaming hot stuffing, fragrant with celery, onions and spices. Tangy cranberry sauce. Thick slices of freshly baked bread. Giant spoonfuls of real mashed potatoes. Homestyle gravy, simmering hot. 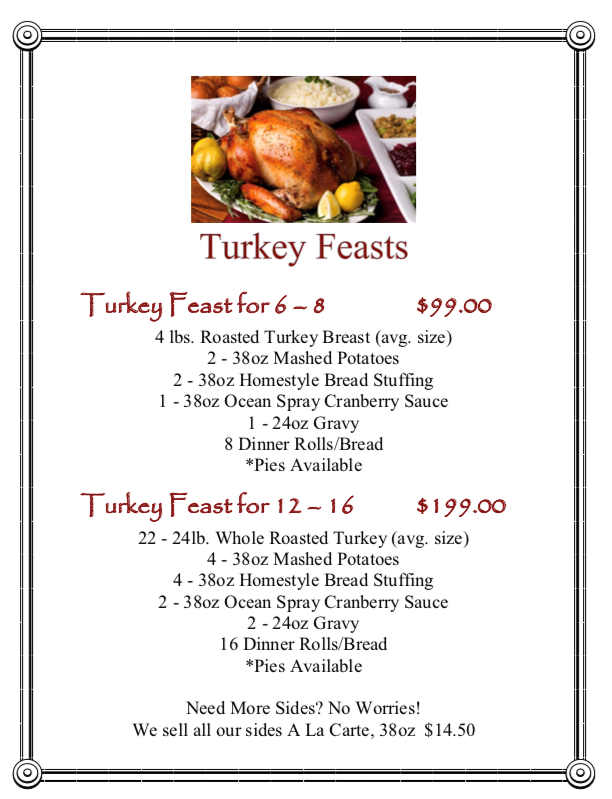 Our fresh turkeys are slow roasted to perfection each day. Our breads are baked and delivered each morning by local artisan bakers. Each of our ingredients and every recipe is carefully chosen and constantly evaluated. 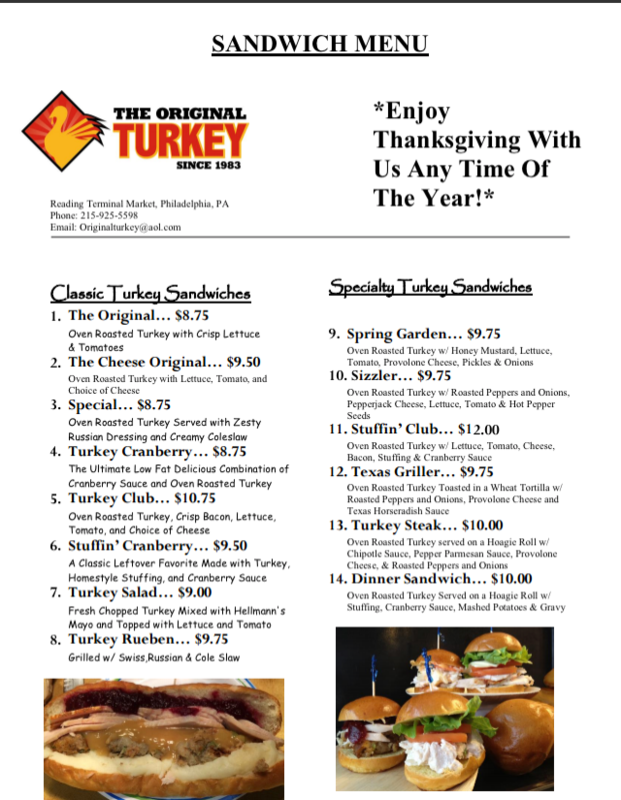 At The Original Turkey, we refuse to compromise on quality. It’s a difference customers notice. 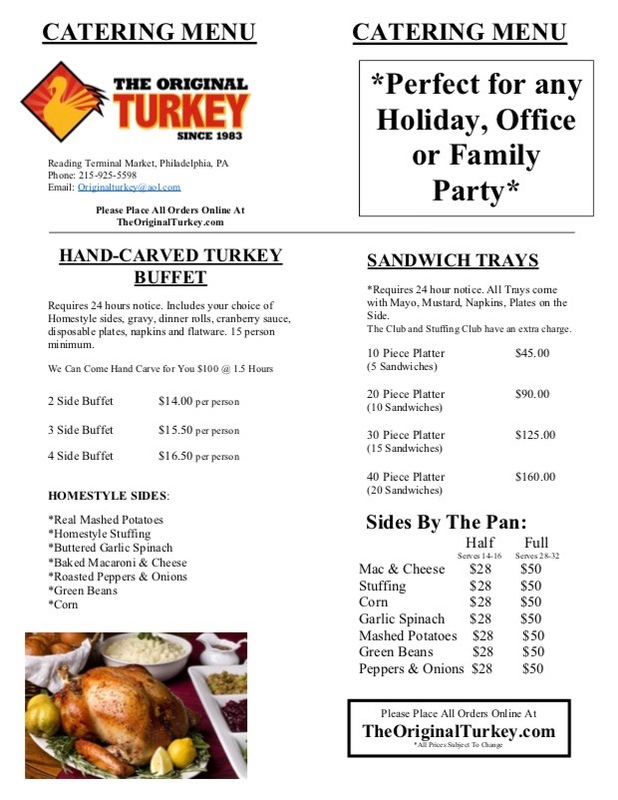 Customers come for the variety of gourmet sandwiches, for the hot turkey platters, for the delicious array of breads and side orders–from our famous stuffing to the real mashed potatoes to baked macaroni and cheese. Real Food. Comfort Food. NOTE: Do not leave cooked food at room temperature for more than 2 hours. 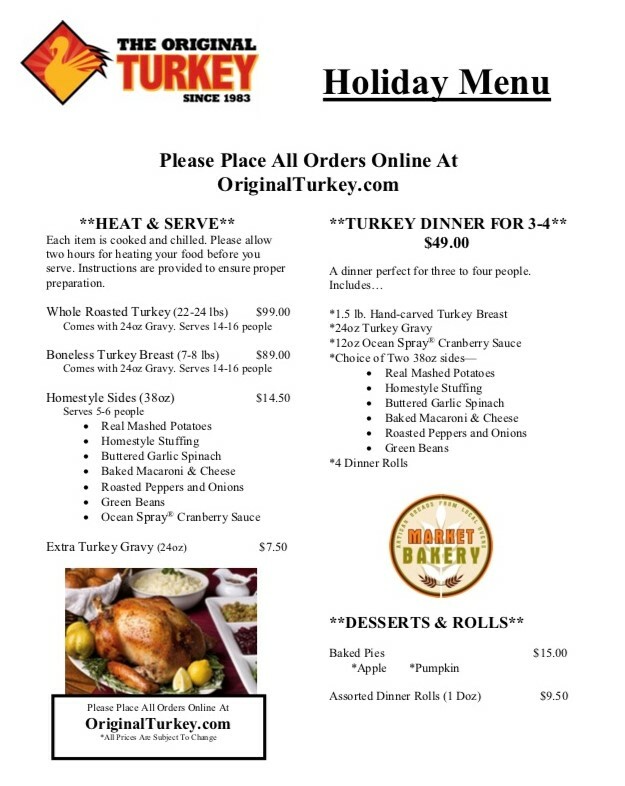 Please refrigerate leftovers below 40 degrees F.
Refrigerate turkey until ready to heat. DO NOT microwave. Leave drippings in pan or add 1/2 inch of water to bottom of roasting pan and cover breast with foil. Cook in preheated oven for approximately 1½ – 2 hours or until internal temperature reaches 140 degrees F.
Remove foil to brown. Continue cooking until internal temperature reaches 150 degrees F.
Remove from oven and let sit for 30 minutes before slicing. Refrigerate turkey until ready to heat. DO NOT stuff the turkey. DO NOT microwave. Leave drippings in pan or add 1/2 inch of water to bottom of roasting pan and cover breast with foil then whole pan with foil. Cook in preheated oven for approximately 2 – 2 ½ hours or until internal temperature of thighs reaches 140 degrees. Remove foil from pan, keep foil on the breast. Continue cooking until thighs reach 160 degrees. Remove foil from turkey to brown. Continue cooking until thigh temperature reaches 170 degrees. Remove from oven and let sit 30 minutes before slicing. Keep food refrigerated until ready to heat. DO NOT reheat plastic containers in the oven. Transfer stuffing into an oven-safe dish or keep in foil pan if provided. Cook in preheated oven for 30 minutes or to an internal temperature of 160 degrees F.
Heat on high for 4-6 minutes (This will vary by microwave and depending on quantity of item). Remove lid and stir well. (If potatoes are too thick, add a little milk or ½ and ½ and stir.) Re-cover loosely and heat on high for an additional 1 minute. Cook to an internal temperature of 150 degrees F.
Carefully remove from microwave (container will be HOT!) and let stand for 2 minutes. Carefully remove lid, stir, and serve immediately. Heat on high for 3-5 minutes (This will vary by microwave and depending on quantity of item). Remove lid and stir well. Recover loosely and heat on high for an additional 2 minutes. Cook to an internal temperature of 150 degrees F.
Carefully remove from microwave (container will be HOT! ), remove lid, stir, and serve immediately.